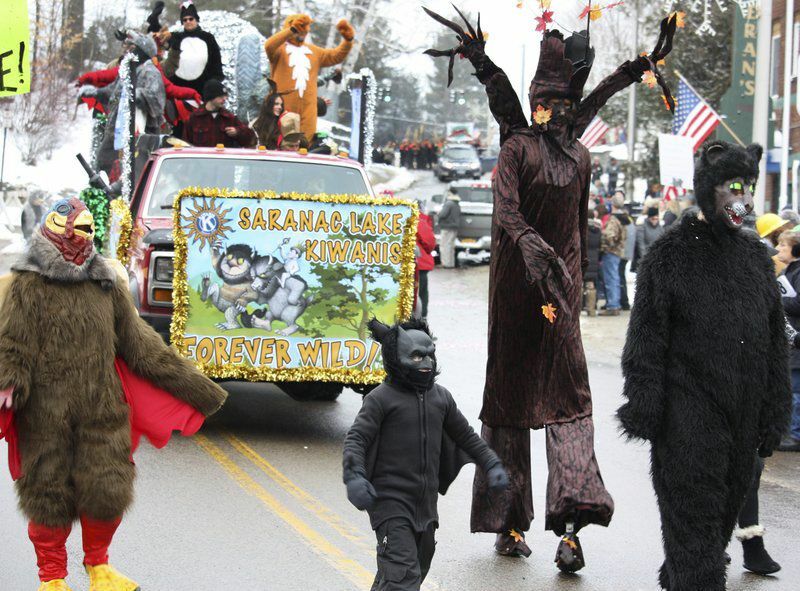 Three deer, a turkey, a black bear and even a bat were among the wildlife walking ahead of the Saranac Lake Kiwanis Club’s float in Saturday’s gala parade. 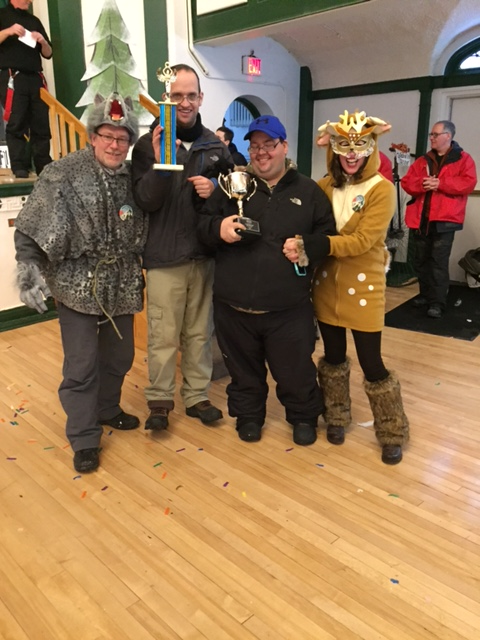 He didn’t fall, and the combination of wildlife, wild music and wild blasts of confetti came together to win the club the Civic Organization Float category of the Saranac Lake Winter Carnival event and also Best in Show Louis Fobare Trophy. The theme this year was Adirondack Wildlife, and the Kiwanians ran with it. “We reintroduced wolves to the Adirondacks,” Reilly said with a chuckle. And each time those woodland noises blasted from the borrowed speakers, powered by a borrowed generator, all but one costumed participant froze in place. The wolf on the float (Keith Freeman), however, pretended to howl. “That’s how we made our way down Broadway,” Reilly said. As if that weren’t enough, the club went a little wild with imagination, garbing Roger Steinbrueck and Aktion Club member Jason Borden both as Elmer Fudd of Bugs Bunny fame and putting them in charge of the two confetti blasters that thrilled the crowd. “So they were the hunters,” Reilly explained how that fit with the theme. And the bat — 6-year-old Natalie Staves — put on the wild act. “She just went down that parade route flapping her wings, giving fist bumps,” laughed Reilly. And when the float had to stop because of traffic ahead, she would run back and gesture for it to move on. The turkey walking beside her was her mother, Jamie Staves. That was an interesting wild species blend, the club president noted. While the Kiwanis Club has marched in past parades “in silly costumes,” Reilly said, this was its first float. The group participated in the carnival another way, paying the admission cost for all the children competing in events such as skating and inner-tube races. The club has some august members of carnival history, among them Steinbrueck, a former king, and Kathy Ford, a past queen, who was a cardinal on the float. The club meets at 7:40 a.m. Thursdays at the Blue Moon Cafe, and anyone interested in testing the waters as perhaps a member is invited to stop in. “How much fun could you have?” Reilly said, again laughing. Just ask Borden (Elmer Fudd) and Ricky Sullivan, who played the bear. Both members of Kiwanis’s Aktion Club, those young men were just wild about being given the role of accepting the two trophies. Reilly said they held onto those awards the rest of the day. “They’re probably still carrying them around right now,” he said Tuesday. Kiwanian Animals Accept Parade Trophies!